Either you’re a Jeep Girl or you know one!!! Maybe both! 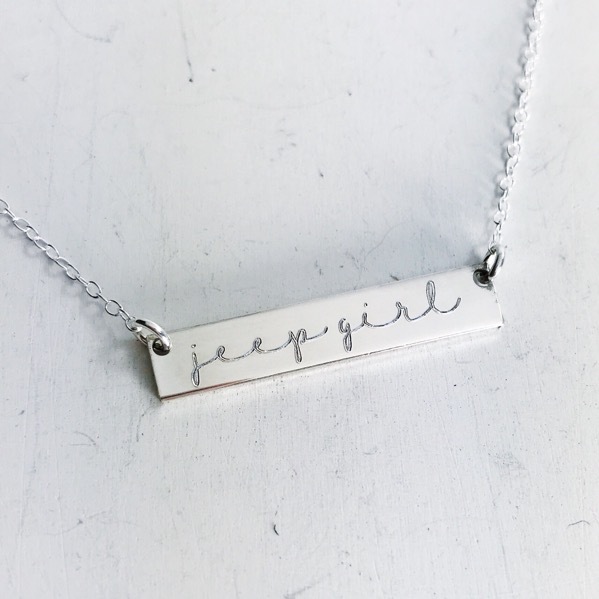 All your Jeep Girl friends will want one! You choose the length. Please remember that the bar is 1.25” Long which may make the necklace seem a little longer than the chain length. Select your chain length in the pull down menus, then add to cart. Each necklace is made to order for you in our Florida studio. Proudly crafted by a Jeep Girl in the USA *This is a new item available at an introductory price for a limited time. What is gold fill? Gold Fill is a layer of 14k gold (yellow or rose) that is applied over a base metal (brass in this case). This process is applied by heat and pressure making it a superior choice over other gold colored metal options. Unlike plated gold items, gold Fill does not flake or chip off with normal care and use.